All Regional Offices & ZIETs. 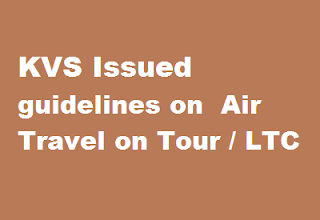 During the audit on the accounts of Regional Offices and Kendriya Vidyalayas, the audit parties observed that the officers entitled for travel by Air have booked their Air Tickets through private travel agencies, which is not in order as per the extant orders and have also objected to it. As per the Government of India guidelines, Air Tickets may be purchased directly from offices of the Air India ( at Booking counters/website of Airlines) or by utilizing the services of Authorized Travel Agencies namely M/s Balmer Lawrie & Company, M/s Ashok Travels & Tours and IRCTC (to the extent IRCTC is authorized as per DoPT’s OM No.311011/6/2002-Estt. (A) dated 02.12.2009). The same procedure should be following for booking the Air Tickets for performing the Leave Travel Concession travel facility. 1. Government of India, Ministry of Personnel, Public Grievances and Pensions (Department of personnel and Training) OM.No.311011/6/2002 – (Estt. (A) dated 2nd December 2009. 2. Government of India, Ministry of Finance, Department of Expenditure Office Memorandum No.19024/1/2009-E.IV dated 16th September, 2010. 3. Government of India, Ministry of Finance, Department of Expenditure, Office Memorandum No.19024/1/2012/E.IV dated 9th July 2013. 4. Government of India, Ministry of Personnel, Public Grievances and Pensions (Department of personnel and Training) OM.No.311011/5/2014-(Estt. (A-IV) dated 23rd September 2015. In this connection, Deputy Commissioner, Regional Offices and Director, ZIETs are requested to Inform their subordinate offices for strict Compliance of the above orders. The undersigned is directed to refer to NFIR’s Ieuer No.Il/I-A’Part 20, dated 05.10.2015 on the above subject.. The matter has been examined in consultation with Estt. Dte. of Railway Board and it is stated that Board’s instructions dt. 14.09.2012 was issued in pursrsurance of DoP&T’s clarification issued on 03.04.2012, which in turn emanated from the earlier clarification given by DoP&T in December, 2009 while reviewing the Scheme of Compassionate appointment in the light of specific para 2.2.9 and 2.2.10 of the 6th Pay Commission recommendations as accepted by the Government of India. In para 2.2.9, a separate running Pay Band designated as -IS scale was recommended for posts belonging to Group ‘D’. However, the same was not to be counted for any purpose. In pam 2.2.10, Commission has also recommended that no direct recruitment in -IS scale would take place. The scale would, however, be operated for regulating emoluments during the training period of candidates who do not possess the minimum qualification of Matric. The Commission was of the firm view that candidates not possessing the minimum qualifications of Matric could not be recruited in the Government. At the same time, Commission also recommended that in exceptional circumstances like compassionate cases, Government might need to provide employment opportunities to certain classes of persons not immediately meeting the minimum educational standards and Government could recruit them as trainees who would be given a regular Pay, Band and Grade Pay only on acquiring minimum qualification prescribed under the Recruitment rules. 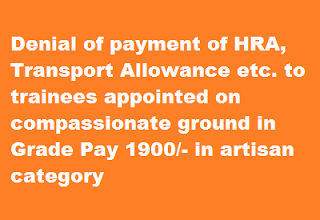 Thus, it is amply clear that.Board’s instructions dated 14.09.2012 applied only exclusively in cases, where candidate being considered for appointment on compassionate grounds are not meeting the minimum qualification of entry into the Government service that is, in Grade Pay Rs.1800/- and the word ‘trainees” have been coined only for this limited purpose. It has nothing to do with trainees in various posts of Grade Pay Rs.1900 & above, where it is mandatory for persons being considered to clear the entire training period before joining a working post. There is a difference between a trainee and an employee. While a trainee gets stipend, the employee gets salary along .with all other allowances. The recruitment rules provide what benefit be given to trainees.Therefore, Federation’s demand is not feasible for acceptance. AIBOA, known for its stand justify from inception, calls upon the officers not to do any clerical work in all the offices and make the solidarity strike on 08.01.2016 a resounding one. 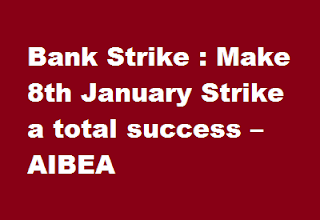 Make 8th January 2016 strike a total success – massively associate yourselves against the naked attacks on bipartism in Associate Banks. Further to our Circular dated 14-12-2015, we have duly served the notice on IBA and all Bank managements about our call for strike on 8th January, 2016 against the violation of bipartite settlement, negation of collective bargaining and repudiation of our hard-won trade union justifys by the managements of Associate Banks at the behest of SBI. We desired to resolve the issues through bilateral discussions and that is why on two occasions we deferred the strike call. But our hopes have been belied. Associate Banks’ managements and SBI feel that they are masters on their own. They do not want to respect Bipartite Settlement. They do not care for collective bargaining. They seem to be not subject to any reasoning or rationale except their whims. They seem to be more interested in confrontation than dialogue and resolution. They persist with the violations. They insist on CPS. They are not bothered about existing settlements that subsist. They do want to desist from their wrongful decisions. Hence revival of the agitation has been forced on us. That is why the call for All India Bank Strike on 8th January, 2016. Instead of utilizing dialogue and discussion to resolve the issues, the managements are in aggravation mode. One by one, the managements have gone ahead with their unilateral actions. Offer letters under CPS have been served on the employees in the Associate Banks. As expected, employees are spontaneously and massively rejecting the offer. But the managements are bent on moving in their own way. IBA’s attitude is also lukewarm and IBA appears to be a spectator instead of interfering in the matter and advising the Associate Banks to adhere to the bipartite settlement. That is why we have to show our strong resentment and observe the strike successfully. 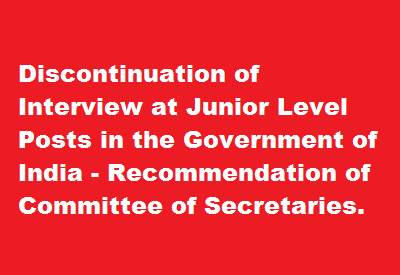 Discontinuation of Interview at Junior Level Posts in the Government of India - Recommendation of Committee of Secretaries. 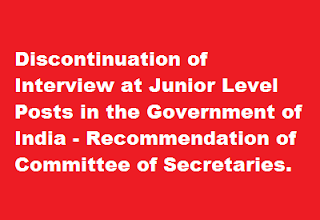 Subject:- Discontinuation of Interview at Junior Level Posts in the Government of India - Recommendation of Committee of Secretaries. (a) The decision to discontinue interview for recruitments is for all Group ‘C’, Group (which are now reclassified as Group ‘C’) Posts and for non gazetted posts of Group ‘B’ Category and all such equivalent posts. 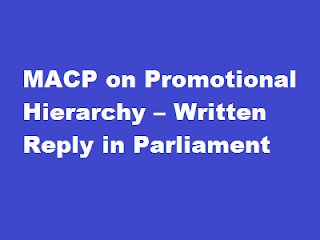 (b) The ‘No Interview Requirement” proposal has to be implemented for all the junior level posts in Government of India Ministries / Departments / attached Office/Subordinate Office/Autonomous Bodies/Public Sector Undertakings. 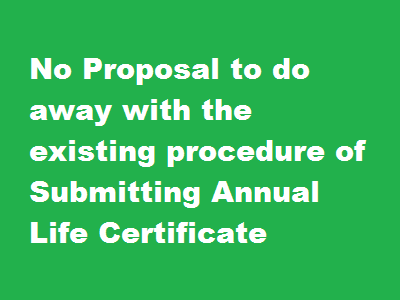 (c) Instructions issued by the Department of Public Enterprises on 14th December, 2015 vide OM No. DPE-GM to all Administrative Ministries concerned with CPSES under them with advice to dispense with the practice of interview. (d) The timelines set regarding completing the process of the discontinuation of interview by 31.12.2015 has to be adhered to strictly. From 01 st January, 2016 there will be no recruitment with interview at the junior level posts as mentioned at 2(a) above, in Government of India Ministries / Departments / attached Office / Subordinate Office / Autonomous Bodies / Public Sector Undertakings. All the advertisement for future vacancies will be without the Interview as part of the recruitment process. 3. All the Central Ministries/Departments are therefore requested to ensure that necessary action in respect of their Ministry / Department / Organizations are completed within the stipulated time. At present, there are 16.35 crore LPG consumers in the country. With the implementation of the PAHAL Scheme (DBTL), the subsidy is being transferred directly to the Bank Account of 14.78 crore LPG Consumers. The objective of the scheme was to ensure that the subsidy benefits go to the targeted group. The Government had also given a call to the well-to-do households for voluntarily giving up LPG subsidy. So far, 57.50 lakh LPG consumers have opted out of LPG subsidy voluntarily heeding the call given by the Prime Minister. The subsidy saved from the ‘GiveitUp’ campaign is being utilized for providing new connections to the BPL families under the ‘Giveback’ campaign. This enables provision of LPG, a clean fuel, to poor households by replacing the conventional fuels such as kerosene, coal, fuel wood, cow dung, etc. relieving the poor of the hardships and health hazards from such fuels. While many consumers have given up subsidy voluntarily, it is felt that consumers in the higher income bracket should get LPG cylinders at the market price. 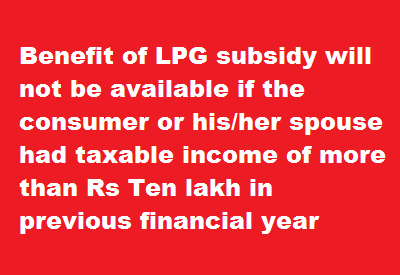 Therefore, the Government has decided that the benefit of the LPG subsidy will not be available for LPG consumers if the consumer or his/her spouse had taxable income of more than Rs 10,00,000/- during the previous financial year computed as per the Income Tax Act, 1961. In keeping with the approach of trusting the citizens, this will be given effect to initially on self-declaration basis while booking cylinders from January 2016 onwards. The 900-page long report of the 7th Pay Commission was submitted to the government on November 19. One of the most important recommendation on the report is the Fitment Factor. It is the most important factor deciding the hike of salaries of the Central Government employees. Fitment Factor is used to calculate the revised basic pay of existing employees with effect from the implementation of 7th CPC. The new revised basic pay of a Central Government employee is calculated by multiplying his/her current (Pre-revised) basic pay with the Fitment Factor. The 7th Pay Commission has recommended a uniform Fitment Factor of 2.57 for all. The actual raise/fitment recommended by the Commission is 14.29 percent only. The report says that the fitment includes a factor of 2.25 on account of DA neutralisation, assuming that the rate of D.A. would be 125 percent at the time of implementation of the new pay. The 7th Pay Commission has evolved a new pay fitment table by merging the existing Grade Pay and Pay Bands for all group of Central Government employees, which is called as Pay Matrix Table. The Pay Matrix comprises two dimensions. It has a “horizontal range” in which each level corresponds to a ‘functional role in the hierarchy’ and has been assigned the numbers 1, 2, 3, and so on till 18. 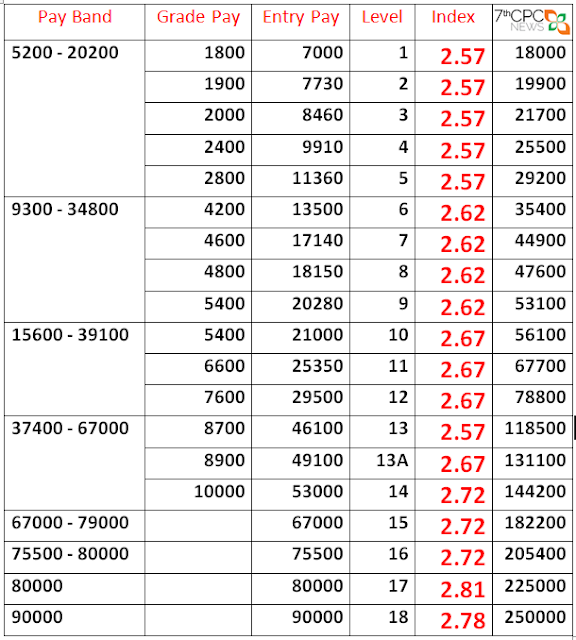 The “vertical range” for each level denotes ‘pay progression’ within that level. These indicate the steps of annual financial progression of three percent within each level. The starting point of the matrix is the minimum pay which has been arrived based on 15th Indian Labour Congress (ILC) norms or the Aykroyd formula. On recruitment, an employee joins at a particular level and progresses within the level as per the vertical range. The movement is usually on an annual basis, based on annual increments till the time of their next promotion. When the employee receives a promotion or a non-functional financial upgrade, he/she progresses one level ahead on the horizontal range. The Pay Matrix chart has included a number of Fitment Factors. 6 types of Fitment Factor, including 2.57, 2.62, 2.67, 2.72, 2.78, and 2.81, have been listed. Under the heading of ‘Index,’ all the Central Government employees have been divided into 18 categories. Since different Fitment Factors have been used for all these categories, it leads one to believe that the new factor will apply for the existing employees too. Criticism has come from all the circles over the addition of a mere 14.29%, leading to 2.57, while the employees were currently drawing a dearness allowance of 125% of their basic pay. The minimum wages have been decided on this criterion alone (the 6th Pay Commission had fixed the minimum wages as Rs.7000. The 7th CPC minimum wages of 18,000 has been arrived at by multiplying the previous number by 2.57). One might remember that similar requests were presented at the time of the 6th Pay Commission too. The commission had recommended the Fitment Factor of 1.74, but, due to constant pressure from the NC JCM Staff Side members, it was increased to 1.86. 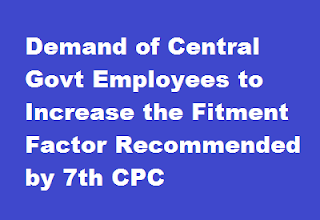 The demand to increase the 2.57 Fitment Factor along with the 14.29 percent hike is growing among the Central Government employees. After the release of 7th CPC Report, all central government employees have calculated the revised pay using the Pay fixation method and using online calculators. 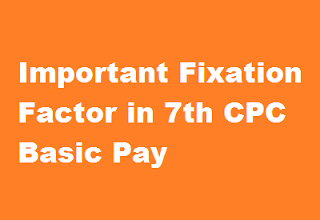 However, there are quite a few basic pays values which need to be calculate differently for the exact revised pay as per 7th CPC Recommendation. If you look at both the examples, there is a different in drawn pay and the revised pay as per 7th CPC is the same, which is not right for the employee “B” and a loss for this employee. 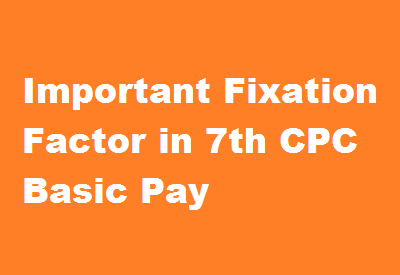 To overcome this 7th CPC has recommended to do two stage bunching which means employee “B” should be given 3% additional increment and pay fixed in the subsequent cell in the pay matrix. Sub :– Rounding off of a fraction of a Rupee in regulation of additional pension. The undersigned is directed to say that vide this Department’s letter No.17(4)/2008(1)/D(Pen/Pol) dated 11/11/2008 and letter No.17(4)/2008(2)/D(Pen/Pol) dated 12/11/2008, instructions were issued for grant of additional pension/family pension @ 20% to 100% to old pensioners/family pensioners of the age of 80 years and above. 2. A question has been raised as to how the amount of additional pension is to be regulated in cases the additional pension results in fraction of a rupee. 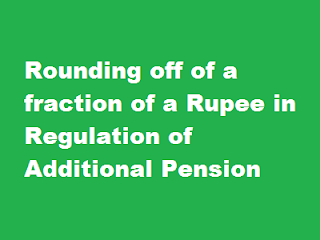 The matter has been examined in consultation with Ministry of Finance (Department of Expenditure) and Deptt of Pension & Pensioners Welfare and it has been decided that the amount of additional pension as finally calculated, may be rounded off to the next higher rupee. In cases the pension/family pension of old pensioners has been fixed/revised without rounding off the additional pension, in those cases also, the additional pension may be rounded off in the next higher rupee hereinafter. However, no arrears for the period from 1.1.2006 on account of such rounding off would be paid in those cases. 3. This issues with the concurrence of. Ministry of Defence(FinNo.1(6)/2015/D(Pen/Pol) /Pen) vide their ID No. 25(06)/2015/Fin/Pen dated 07.12.2015. 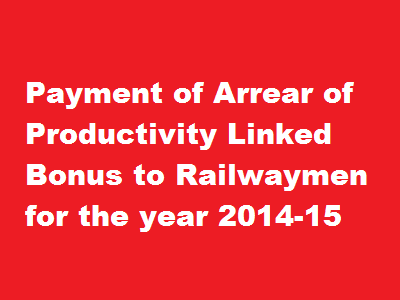 The Payment of Bonus (Amendment) Bill, 2015 was introduced in Lok Sabha by the Minister of State for Labour and Employment, Mr. Bandaru Dattatreya, on December 7, 2015. The Bill seeks to amend the Payment of Bonus Act, 1965. AIRF has demanded an Arrear on PLB for FY 2014-15. 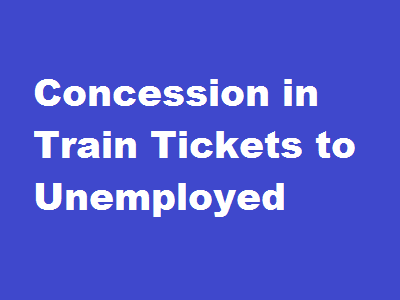 Railways grant full concession in second class and 50% concession in sleeper class in the basic fares of Mail/Express trains to unemployed youths up to 35 years to appear in interviews for selection to Central/State Government jobs. Besides above, 50% concession in the basic fares of Mail/express trains in Second and sleeper class is also admissible to unemployed youths appearing in interview for selection to other public sector organisations. This Press release is based on the information given in the written reply by the Minister of State for Railways Shri Manoj Sinha in Lok Sabha today. The employees including Group ‘C’ (which includes erstwhile Group ‘D’) are granted three financial upgradations under Modified Assured Career Progression (MACP) Scheme in the next immediate Grade Pay hierarchy as per CCS(Revised Pay) Rules, 2008 on completion of 10, 20 and 30 years of regular service. There have been instances where Tribunals and High Courts have directed to grant benefits under Modified Assured Career Progression (MACP) Scheme in the promotional hierarchy. However, in such cases, the order of Court is specific to the applicant only. This was stated by the Minister of State in the Ministry of Personnel, Public Grievances and Pensions and Minister of State in the Prime Minister’s Office Dr. Jitendra Singh in a written reply to a question by Shri Kamlesh Paswan in the Lok Sabha today. 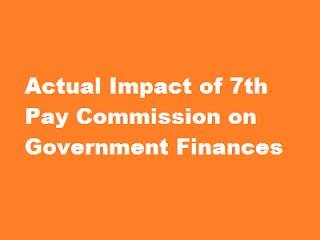 There are various reports in the media about the impact of the 7th CPC recommendations on the common man and the government resources at large, the reports suggest that additional amount of Rs one lakh crores of public money has been spent for implementation of the 7th CPC recommendations for 35 lakhs central Government employees, Perhaps the strongest criticism of Pay Commission awards is that they play havoc with government finances and also state government demand support to implement the 7th CPC recommendations. At the aggregate level, these concerns are somewhat exaggerated and which is totally wrong. 3.66 The expenditure per capita on pay and allowances for Civil Central Government personnel for FY 2012-13 was Rs 3.92 lakh per annum i.e Rs 32666/- per month. Add 35% DA for the period 1/4/2013 to 1/1/2016 average salary of Civil Central Government personnel as on 1/1/2016 at 125% DA which works around Rs 37500/- per month (Rs 4.50 lakhs per annum ) without 7th CPC recommendations . ie Rs 1.57,000 crores Add average 16% wage increase due to 7th CPC which works out to Rs 43500/- per month Rs 5.22 lakhs per annum) with 7th CPC implementation . Total Expenditure for 35 lakhs for Civil Central Government personnel for FY 2016-17 is around Rs 1,83,000 crores In respect of pensions expenditure for 55 lakhs pensioners amount is around Rs 81,000/ crores as on 1/1/2016. which is against the revenue receipts of Rs 19 lakh crores. 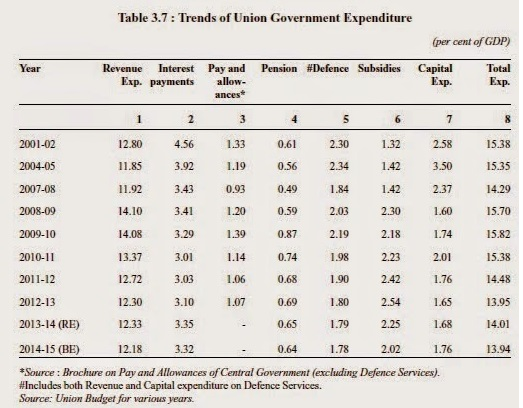 The percentage of revenue receipt and wages is just around 13 % of the total revenue is spent on the wages and pension for the Central Government personnel. In fact it is just at 1.3 % of the GDP. This clearly shows that that the increase in impact for the government of India finances is just below additional Rs 25,000/- crores not additional Rs 1,00,000/- crores as per the media reports. The 7th CPC recommendations’ impact need not give jitters to the government because the rise in government wages will amount to only 0.4 per cent of GDP. Payment of Bonus (Amendment) Bill 2015 to increase the Bonus Calculation Ceiling and eligibility ceiling has been Passed in Lok Shabha yesterday. 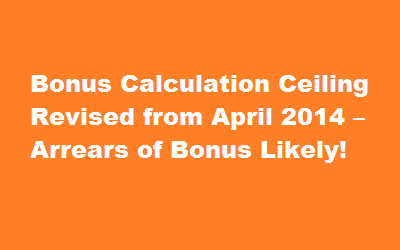 As per the provisions of Bonus bill the Bonus Calculation ceiling has to be raised from 3500 to 7000 and eligibility ceiling of wage from 10000 to 21000 per month. Earlier Cabinet gave its approval for this Bonus bill and said it will be come into effect from 1.4.2015 after passed in Parliament. Now Labour Minister Bandaru Dattatreya said while moving an official amendment to the Bill, ”The Prime Minister spoke to me and asked why should the benefits of this Act should accrue to workers from 2015, it should made available from the April 2014?. It is really very good news for entire working class, since it is coming into force with effect from 1st April 2014. 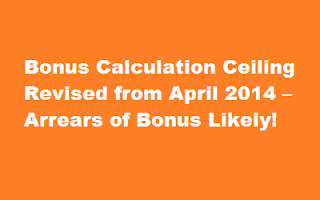 Due to this retrospective effect of Bonus Act from 1.4.2014, double the amount of Bonus has to be paid for the year 2014-2015. The Bonus amount for 2014-2015 was Calculated as per the Calculation ceiling of Rs.3500 and paid before Dhasara/ Durga Pooja and Diwali. 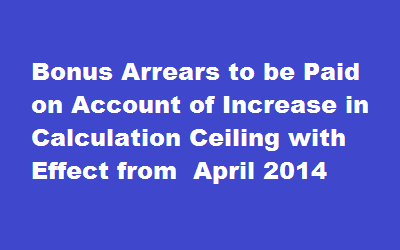 So Bonus arrears have to be paid on account of increase in calculation ceiling and eligibility ceiling. Soon after the Bill passed in Rajya Sabha, necessary Order will be issued by Finance Ministry after publishing gazette Notification for the amendment in Bonus Act. The Lok Sabha on Tuesday passed a bill allowing doubling of wage ceiling for calculating bonus to Rs 7,000 per month for factory workers with establishments with 20 or more workers, with the benefits being applicable retrospectively from April 2014. The Payment of Bonus (Amendment) Bill, 2015, was passed by a voice vote, with some members objecting to the raising of eligibility limit for payment of bonus from a salary of Rs 10,000 per month to Rs 21,000. Replying to a debate on the legislation, Labour Minister Bandaru Dattatreya said the Government has ensured that the interest of workers are protected and there is no infringement on their justifys. “Because of Bihar Elections this bill got delayed… The Prime Minister spoke to me and asked why should the benefits of this Act should accrue to workers from 2015. It should be made available from the April 2014,” he said while moving an official amendment to the Bill. The official amendment provides that the benefits of the Act would be deemed to have come into force on April 1, 2014, instead of April 1, 2015. Dattatreya said the Ministry has held 21 tripartite meetings with all central trade unions while arriving at a decision. The Bill provides for enhancing monthly bonus calculation ceiling to Rs 7,000 per month from the existing Rs 3,500. It also seeks to enhance the eligibility limit for payment of bonus from Rs 10,000 per month to Rs 21,000 per month. “The Government’s paramount intention is to safeguard the interest of workers… There is no infringement of workers’ justifys and whatever the government does will be in the interest of workers,” Dattatreya said. After the bill was passed, Deputy Speaker M Thambidurai, who was in the Chair, said the government should be congratulated for bringing the measure as also for effecting the benefits retrospectively. 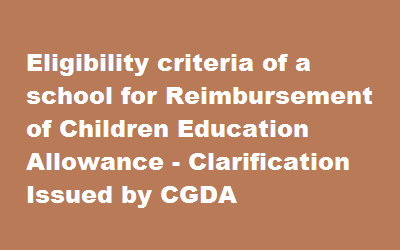 The matter regarding admissibility of CEA in r/o of the children studying in Pre-primary schools run by Army welfare Education Society (AWES) was referred to MoD by Hqrs office. 2. MoD D (Pay/Services) has stated that criteria of eligibility of a school is clearly mentioned in para 3 of DOPT O.M. No. 21011/03/2008-Estt (A) dated 23rd November, 2009 which reads “Recognized school/institution in this regard means Govt. school or any education institution whether in receipt of Govt. aid or nor, recognized by the Central or State Govt. or Union territory administration or by University or a recognized educational authority having jurisdiction over the area where the institution is situate.” The MoD D (Pay/Services) has further stated that it is for the concerned beneficiaries to obtain the necessary details from the school regarding its recognition by the concerned authorities and submit them to the paying authorities alongwith the claim for reimbursement. 3. The subject claim may be regulated accordingly. 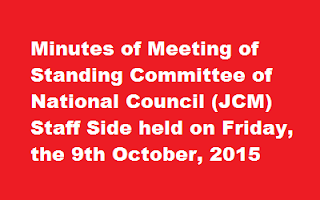 Subject:- Minutes of Meeting of Standing Committee of National Council (JCM) Staff Side held on Friday, the 9th October, 2015 under the Joint Chairmanship of JS(AV), DoP&T — regarding. The undersigned is directed to forward herewith a copy of the minutes of the Meeting of Standing Committee of National Council (JCM) Staff Side held on Friday, the 9th October, 2015 at 1500 hours in Room No. 190, Conference Room, North Block, New Delhi under the Chairmanship of Joint Secretary(AV) for information and necessary action. Action taken report on the items pertaining to them may also be furnished to this Department at the earliest. The list of participants who attended the meeting is at Annexure. 2. Welcoming the participants, Ms Archana Varma, Joint Secretary, DOP&T informed that as authorised by the Competent Authority, this meeting has been convened to take stock of the issues raised by the Staff Side in the Charter of Demands submitted by them in July 2015. The purpose of the meeting is to understand the issues in its proper perspective. This meeting would lay the ground work for holding the meeting of Standing Committee under the Chairmanship of Secretary (Personnel) and thereafter the meeting of the National Council. 3. Initially, the finalisation of meetings of National Anomaly Committee meetings held on 29th May 2015 and 9th June 2015 under the Chairmanship of JS(E) was taken up for discussion. It was noted that the draft minutes of 29th May and 9th June 2015 were drafted by the Official Side and sent to the Staff Side for their perusal and concurrence. The Staff Side had proposed certain suggestions/amendments in the NAC meeting minutes. On those suggestions/amendments, the views of Department of Expenditure, Ministry of Finance had been obtained and the minutes are now ready for finalisation. The Staff Side expressed their concern about delay that had taken place in finalisation of these minutes. They suggested that as per past practice, a meeting may be convened in DOP&T to discuss the draft circulated by the Official side and the suggestions/amendments made by the Staff Side. It was decided that a meeting would be convened by DS (JCA) shortly with the Staff side to finalise the minutes of meeting of NAC held on 29th May and 9th June 2015. 4. Various members of the Staff Side explained the background relating to constitution of the Joint Consultative Machinery (JCM). It was informed that JCM is the negotiating machinery to look into the grievances of the Central Government employees. They informed that the continuous dialogue in the form of JCM helps in avoiding confrontation between employees and the Government through resolution of various disputes that can be settled between them. It was noted that the meeting of National Council of JCM had not been convened for more than five years and therefore there is urgent need for convening the meeting of the National Council. Noting that the last meeting of the Standing Committee was held in February 2015 at the level of Secretary (Personnel), the Staff Side suggested that a meeting of the Standing Committee, at the level of Secretary (Personnel), should be convened at the earliest. (c) Grant interim relief and merger of 100% D.A. All these agenda items are linked to the recommendations of the 7th Central Pay Commission and were taken up together. The Staff Side noted that in the case of banks and public sector undertakings, the Government has been considering 5 year wage revision and similar facility should also be considered for the central government employees. It was informed by them that the 5th Pay Commission had fixed the tenure of pay revision as 10 years. 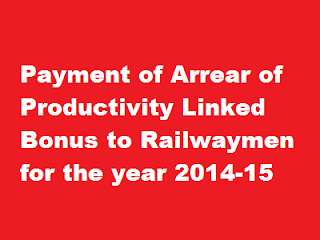 However, as the dearness compensation crosses the 50% mark normally over a period of five years, the Government should consider pay revision over a periodicity of 5 years. The Staff Side further demanded that the effect of wage revision of central government employees be from 1.1.2014. It was further demanded that as the 7th CPC has been given extension of time to submit its report, the Government should consider granting interim relief and merger of 100% Dearness Allowance. The Official Side informed that pay revision of Central Government employees based on the recommendations of Pay Commission has generally been made after a gap of 10 years. The last such revision is effective from 1.1.2006 based on the recommendations of the 6th Pay Commission. The Government set up the 7th Pay Commission in February 2014, ahead of the general 10 year interregnum. Therefore, as regards implementation of pay revision from 1.1.12014, the same seeks a much shorter interregnum and is not in keeping with the practice so far followed. 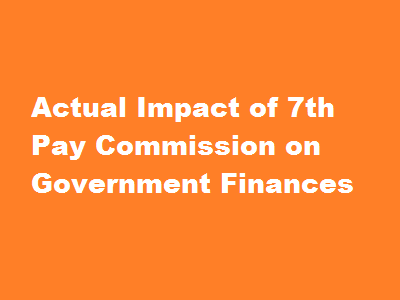 The TOR of the 7th Pay Commission also require to it recommend the date of effect of its recommendations and, hence, the decision on the date of effect thereof would be taken after the recommendations of the Commission are received. As regards the payment of interim relief, as the Government set up the Commission well in advance of the 10-year duration from the date of effect of the 6th pay Commission, the question of Interim relief does not arise. As regards merger of DA with pay, the existing emoluments’ stctrure is based on the recommendations of the 6th Pay Commission which made a specific recommendations against merger of DA. The Official Side, therefore, clarified that at this stage it will not be possible to examine any of the four demands listed in (a) to (d) above. The Staff Side informed that the Grameen Dak Sewaks are the single largest source of postal services in the country and therefore there is need for including this category within the ambit of 7th CPC. The representative of Department of Posts informed that there are about 1.75 lakh work force working as Grameen Dak Sewaks. Department of Posts had reportedly recommended bringing them under the ambit of 7th CPC. However, as these employees are not full time government employees, based on the advice of Department of Expenditure, Ministry of Finance, it has recently been by decided to constitute a Single Member Expert Committee to suggest pay revision for these employees. The Staff Side suggested that if a decision had already been taken to constitute a single member expert committee, instead of setting up a departmental head as the expert committee chief, the Government may consider roping in the services of the 7th CPC Chairman for rendering this service, as the 7th CPC is already aware of the working conditions and other relevant factors of central government employees and would be in a better position to decide the pay revision of Grameen Dak Sewaks. Department of Posts would be requested to examine this suggestion of the Staff Side. The Staff Side informed that as a result of implementation of 6th Pay Commission recommendations, various anomalies have come to the notice of the Staff Side which are conveyed to the Government. Meetings of the joint committee to look into the anomalies have been held but the progress of resolution of anomalies is not satisfactory, as felt by the Staff Side. It was informed that there were more than 58 items of 6th CPC which were discussed by the Anomalies Committee and yet remain unresolved. The Staff Side suggested that the Government should take a view on settlement of all anomalies of 6th CPC expeditiously. The representative of Railways informed that discussions are held regularly with the Staff Side on the issue of PPP or FDI in Railways. Since no meetings with Staff Side are being held by Ministry of Defence, the Staff Side suggested that Ministry of Defence may be requested to hold dialogue with the Staff Side on such issues. DOP&T would accordingly take up the matter with Ministry of Defence. The representative of Department of Posts informed that at present there is no proposal on corporatisation of postal services. The Staff Side informed that Department of Expenditure insist on the concept of matching savings for recruitment /creation of posts. In departments like Railways where new posts are to be created or employees are to be recruited for performing new functions like running new trains, maintaining newly created assets etc., this condition is not able to be met and therefore should not be insisted upon. The representative of Department of Expenditure clarified that in case of operational posts which are required for unavoidable operational and functional considerations, the need for not insisting on matching savings is considered on a case-to-case basis. However, as regards the suggestion of the Staff Side to issue a general circular on this issue, he clarified that this issue needs to be examined by the Department of Expenditure. (j) Scrap PFRDA Act and re-introduce the defined benefit statutory pension scheme. The Staff Side informed that the implementation of New Pension Scheme and its effect on employees appointed on and after 1.1.2004 is a serious issue which is agitating the minds of central government employees. He informed that they had discussions with Department of Financial Services in the past. However, there has been no progress in solving the issues raised by the Staff Side, especially on the issues relating to social security clauses for employees covered under New Pension Schemes. Reportedly, there is no guarantee of minimum pension or gratuity under the new pension scheme. It was informed that this issue would unite all the central government employees and the Staff Side may consider serious action, including Strike, on this issue. The Staff Side insisted that the New Pension Scheme should be withdrawn and all those employees who are recruited after 01/01/2004 should be brought under the statutory Pension Scheme. Since the official representatives from the Department of Financial Services under whose purview the NPS falls were not present in the meeting, it was decided that the issue would be further discussed with Department of Financial Services. (k) No outsourcing; contractorisation; privatisation of governmental functions; withdraw the proposed move to close down the Printing Presses, the publication, form store and stationery departments and medical stores depots. The Staff Side informed that Ministry of Urban Development has fixed a meeting on the issues raised by them concerning that Ministry. The Staff Side was requested to discuss the issues concerning Ministry of Health & Family Welfare with them separately. The representative of Ministry of Labour informed that they have been in constant touch with trade unions and other stakeholders on issues concerning the welfare of workers. However, the Staff Side pointed out that in addition to consultation with trade unions, the Government should involve the concerned Staff Side representatives before deciding labour reforms as there are a large number of industrial workers in various departments like Railways, Defence, CPWD etc. The Chairperson requested the officials from the Labour Ministry to examine the request of the Staff Side. (n) Revive JCM functioning at all levels as an effective negotiating forum for settlement of demands of the Central Government employees The Staff Side submitted that due to non holding of regular meetings at the Departmental Council levels, even smaller issues which can be sorted out through negotiations, are being taken up in various Courts, thereby resulting in a number of court cases to be defended by the departments/Ministries. They suggested that the institutional mechanism of Departmental Council meetings, Standing Committee meetings and National Council meeting may be revived so that there is continuous interaction between the Staff side and the government. The Staff Side gave detailed justification for removing the ceiling of 5% on compassionate appointments. After discussions, it was agreed by the Official Side that this issue would be examined by Establishment Division of DOP&T. The representative of Ministry of Labour informed that the issue of increase in the bonus ceiling is under consideration of the Government. However, the representative of Department of Expenditure clarified that payment of ad-hoc bonus and Productivity Linked Bonus (PLB) applicable to central government employees is not governed by the Payment of Bonus Act, on which certain changes are under consideration of the Government. The Staff Side however felt that any change in Bonus Act would be an indicator while deciding the payment of bonus to the central government employees. The representative of the Department of Expenditure stated that the issue of PLB and adhoc bonus to central Government employees is covered under the TOR of the 7th Pay Commission and, hence, a view in the mater may be taken based on the recommendations of the Commission. The Staff Side stated that bonus for Central Government Employees was based on an agreement with the staffside and not based on the recommendations of any pay commission. Moreover, every time when the Bonus Act is amended raising the payment ceiling limit, it is extended to Central Government employees also Therefore the Staff Side suggested that as and when the Bonus Act is amended, the same benefit may be considered for extension to the Central Government employees also. The Official Side noted that this issue is linked to the recommendations of the 7th Central Pay Commission. Therefore, this issue would be examined after receipt of the 7th CPC report. The Staff Side from Defence Ministry stated that inspite of various instructions issued by DOP&T cadre restructuring of the various categories of Defence Civilian Employees are not taking place for more than 2 decades. They insisted that the cadre restructuring exercise may be completed before submission of the 7th CPC report. I am confident, by this time you must have studied the 26-point Charter of Demands, submitted by the NJCA to the Cabinet Secretary on 10th December, 2015, circulated vide NJCA’s Circular No.NJCA/2015/7th CPC dated 11th December, 2015. As per decision of the NJCA, the following programmes have to be successfully observed by all your affiliates all over the country. (i) 30.12.2015 Holding demonstrations and hand over copy of the NJCA’s letter dated 10.12.2015 to the Head of the Office for onward transmission to the Cabinet Secretary, demanding for immediate settlement of the issues. (ii) 19-21.01.2016 3-day dharna in all the State capitals and industrial centers/ establishments for educating and mobilizing the employees. 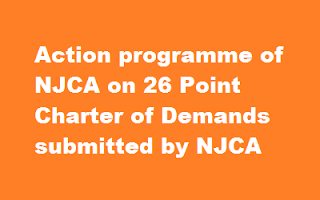 In view of the NJCA’s decision for an “Indefinite Strike”, on the above cited 26-point Charter of Demands, commencing in the 1st week of March, it will be essential that, AIRF, NFIR, AIDEF, INDWF and Confederation of the Central Government employees should conduct strike ballot. It will be quite appropriate that strike ballot is taken by the 2nd week of February, 2016. The NJCA will meet and decide about the date of issue of the Strike Notice and also about the date of commencement of the Indefinite Strike. In the meantime, all out efforts may be made to build up pressure on the government, so that a negotiated settlement can be reached on our demands. I shall keep you informed about the further developments. With fraternal greetings & best wishes for a Happy & Prosperous New Year! a) Affirmative Action Council (AAC) has been formed. The AAC has identified 5 areas of Affirmative-work, Employability, Entrepreneurship, Education and Employment. b) Affirmative Fund has been set up. c) 241944 candidates from Scheduled Caste/Scheduled Tribes (SC/ST) community have been trained in various vocational skills. d) 111697 Scholarships have been provided to SC/ST students. e) 100 Entrepreneurship development training programmes have been held. f) 925 companies have adopted Voluntary Code of Conduct. b) 2036 Scholarships have been provided to SC/ST students. a) 1035 companies have adopted Voluntary Code of Conduct. c) 377 SC/ST students have been imparted Entrepreneurship Development Programmes. d) 3357 scholarships provided to SC/ST students for studying in premier institutions like IITs/ IIMs. e) 35784 candidates have been trained under Skill Development programmes. This information was given by the Minister of State, Social Justice & Empowerment, Shri Vijay Sampla in a written reply to a question in Lok Sabha here today. 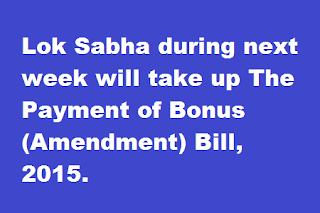 Lok Sabha during next week will take up The Payment of Bonus (Amendment) Bill, 2015.